A variety of services take place over the Christmas period. We prepare for Christmas with Advent sevices and the lighting of the candle on the Advent ring for that Sunday. 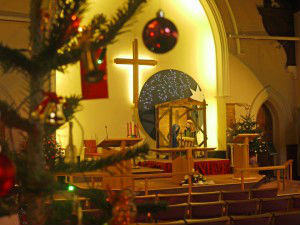 There is usually a Nativity and Gift Service and then a Carol Service by Candlelight the Sunday before Christmas. On Christmas Eve, a Christingle service in the afternoon has become a regular feature followed by Midnight Communion then a Family Celebration Service on Christmas Day.